I haven’t posted anything in quite a while. I’m riding a long wave of creative apathy and straight-up boredom in the kitchen. I have been making the same things over and over; I am not creating new foods over here, and really not searching for any either. In fact, Heather and I have contemplated turning the blog off because we have nothing new to tell you about. Besides, everyone who eats a primal diet appears to have started a blog about it, and with much better photography! In terms of food-spiration, I have nothing. I know how to employ a clean-diet, it is a great tool. I feel sad, because I have seen the paleo/Whole30 community take a turn to the obsessive side over the past few years. Orthorexia is a thing now. For heaven’s sake, have we not just swapped out one crazy for another? All the blogs, and food pics and pins, and humblebragging on social media. Craziness. The saddest thing is when my own friends feel like authentic failures if they have a month or two, or twelve, of bad eating. It is a crazy-cycle. Feelings of tremendous success and pride after accomplishing a month of clean eating, which are subsequently chased away by “failure” (eating some bad food). It becomes ridiculously mentally consuming. Are we equating failing at life with eating sugar/grain/dairy? There is so much talk about “satiety” after meals, and striking that perfect macronutrient-balance, which supports activity but not body fat. That is a great place to be. A clean diet provides plenty of physical benefits, but it offers zero relief for the emotional hunger we endure. That emotional hunger will eat us alive if we do not respond to it properly…we will scratch for anything to fill the void. Heart Satiety is what we need. Isn’t heart-satiety what we are all chasing after, above and beyond the satiety of the stomach? Where can we find such satisfaction of the soul? I have a hint: it starts at taking the focus entirely off of self, and meeting people’s needs with no abandon. That might sound harsh. But tirelessly giving back will never make anyone’s day feel worthless. Take on only the good of the clean-diet lifestyle. Good food and the workouts serve ME, and not the other way around. This mindset is freeing, and makes clean eating all the more enjoyable. There is a general trajectory of good health-choices, which include a healthy social life, and systematically serving others. Knowledge puffs up, but love builds up (1 Corinthians 8:1). Relationships are more important than food! I don’t really agree with this. 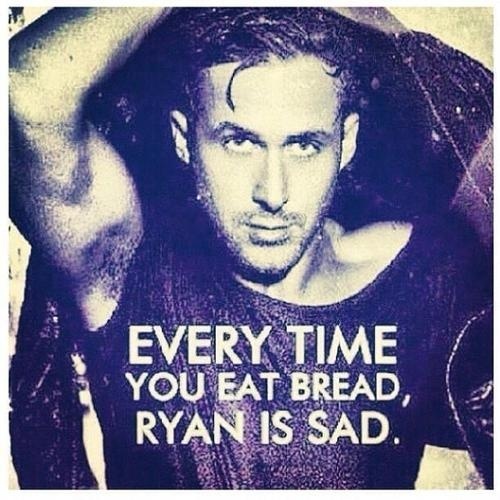 And, I am not attracted to Ryan. You are wise, insightful, and inspirational. I’m blessed to call you my friend. Let’s choose love. Choose forgiveness. Choose life. Choose peace. “Not attracted to Ryan” what does that even mean?! I’m not sure we were ever friends.